After claiming the Hamilton Spectator Trophy, presented to the OHL’s regular season champion, the 67’s hope to add to their accolades this spring in the form of playoff success. As it happens, the opening round of the postseason sees Ottawa matching up with last season’s playoff foe in the Hamilton Bulldogs, who ousted the 67’s in five games. But the tide has turned this year, as the 67’s have become a household team that plays a tight defensive game, as evidenced by their league-leading goals-against figure, while there is no shortage of offense either, led by the likes of Tye Felhaber, who recently inked an entry-level contract with the Dallas Stars, and fellow forward Austen Keating. In Hamilton, despite a hectic deadline that saw the team part with the likes of Brandon Saigeon, Nicolas Mattinen, and MacKenzie Entwistle, the club has continued to find the win column. Forward Arthur Kaliyev, a top prospect for the 2019 NHL Draft, is always a danger to the opposition, while midseason addition in Czech-born forward Jan Jenik has had a promising start in North America. *Game 5, Fri., March 29 at Ottawa – 7:00 p.m.
*Game 6, Sun., March 31 at Hamilton – 7:00 p.m.
*Game 7, Tues., April 2 at Ottawa – 7:00 p.m.
Shutting down the opposition will be key to the series for the Battalion, who will face off against a Niagara squad that has netted the most goals in a single OHL season since the 2010-11 Barrie Colts, who finished with 327 markers. Forward Jason Robertson leads the offensive charge for the IceDogs, as he finished the season with 117 points, the most in the CHL, to go with the Eddie Powers Memorial Trophy as the OHL’s top point getter. Arriving in Niagara in November following a trade from the Kingston Frontenacs, Robertson caught fire with his new club, as he put up 79 points in just 38 games, and was held off the scoresheet just four times. But Robertson isn’t the only dangerous offensive weapon in the series. There’s also NHL-coveted Justin Brazeau, the hulking North Bay right-wing who led the OHL with 61 goals while coming just four points short of Robertson for the scoring lead. Between the pipes, Niagara’s Stephen Dhillon sees plenty of action, as no OHL netminder faced more pucks this season, coming in at nearly 32 shots a game. *Game 5, Fri., March 29 at Niagara – 7:00 p.m.
*Game 6, Sun., March 31 at North Bay – 2:00 p.m.
*Game 7, Tues., April 2 at Niagara – 7:00 p.m. Despite trade deadline deals that saw the Generals move out key players like captain Jack Studnicka, the team still closed out the season on a high note in winning 16 of its final 20 games, including three big wins over their first-round opponent in the Peterborough Petes. The Generals also did some shopping of their own at the deadline, adding forward Brandon Saigeon from the Hamilton Bulldogs, who took little time to catch on with his new club as he netted 12 goals and 17 assists in 28 appearances. The well-balanced squad will prove to be tough competition, though the Petes have a few difference makers of their own in playmaking blue-liner Ryan Merkley, who notched 32 points in 35 games since his December acquisition. In all, he finished the year with 57 assists, tops among all OHL defencemen. There is also goaltender Hunter Jones, who participated in this year’s Top Prospects Game and looks to be an early pick at the NHL draft come June. He’ll go head-to-head with Oshawa goaltender Kyle Keyser, a Boston Bruins prospect coming off a career year. 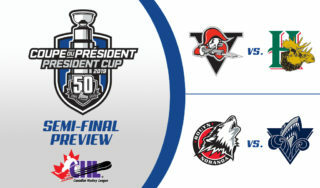 *Game 5, Sat., March 30 at Oshawa – 7:05 p.m.
*Game 6, Sun., March 31 at Peterborough – 7:05 p.m.
*Game 7, Tues., April 2 at Oshawa – 7:05 p.m.
For just the second time in the past five seasons, the Wolves are in the playoff picture, thanks to first-year North American netminder Ukko-Pekka Luukkonen, who is undoubtedly the team’s most valuable player. A draft pick of the Buffalo Sabres, Luukkonen has excelled in his first year in junior, where his six shutouts set a franchise high for the historic Wolves. His ability to keep out pucks, paired with Sudbury’s talent in locking it down on the penalty kill, could prove to be the difference going up against a Steelheads squad led by overage forward Alan Lyszczarczyk as well as 2019 NHL draft-eligible defenceman Thomas Harley, who looks to be the latest high pick to come out of Mississauga. For the Steelheads, deadline deals that saw the team ship out top talents in Florida Panthers prospect Owen Tippett and Edmonton Oilers draft pick Ryan McLeod shifted the scoring duties and created more opportunities for the team’s young players, like right-wing Carter Cole and centre Keean Washkurak, who will now get a shot at experiencing the postseason. 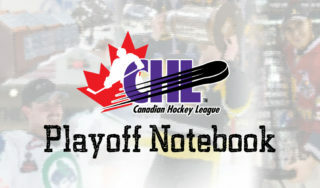 *Game 5, Thurs., March 28 at Sudbury – 7:05 p.m.
*Game 6, Sun., March 31 at Mississauga – 2:00 p.m.
*Game 7, Mon., April 1 at Sudbury – 7:05 p.m. The Knights are once again a force in the OHL’s Western Conference, with a host of draft-eligible talents like Connor McMichael and Matvey Guskov playing key roles. There’s also captain and big-time blue-liner Evan Bouchard, whose busy year included a stint with the Edmonton Oilers and a run with Team Canada at the world juniors before returning to London. 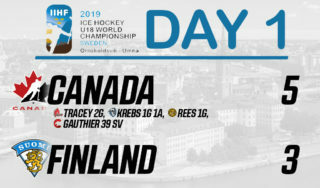 Bouchard provides plenty of offensive punch from the back end alongside Chicago Blackhawks prospect Adam Boqvist. In all, the Knights excel at both ends of the ice as one of the OHL’s most offensive teams while also owning a league-best penalty-killing unit. That doesn’t bode well for a Windsor powerplay that ranks near the bottom, meaning the Spitfires will need to find the back of the net at five-on-five. Up front, the Spitfires bring a balanced scoring attack – six forwards sit between 40 and 55 points – including 19-year-old Cole Purboo, 6-foot-9 centre Curtis Douglas, and fellow forward Jean-Luc Foudy, the brother of Knights forward Liam Foudy, a first-round draft pick by the Columbus Blue Jackets a year ago. Special teams could prove to be a factor in this series – when there are opportunities. With just 592 penalty minutes during the regular season, the Spirit are the league’s least penalized team. And when they are charged with an infraction, the team’s penalty-killing unit is getting it done at a third-best efficiency rating. Meanwhile, only four teams spent more time in the penalty box than Sarnia this season, though the Sting were able to make up for it with a league-leading 22 short-handed goals. At the deadline, the Spirit loaded up, making separate deals with the Steelheads to bring in future NHLers Owen Tippett and Ryan McLeod to provide additional scoring alongside rookie sensation Cole Perfetti, whose 74 points led all OHL freshmen. The Sting have a promising youngster of their own in forward Jamieson Rees, who finished his second junior season with 32 points in 37 games and is eligible for this summer’s NHL draft. Rees and the Sting will have their work cut out for them facing Saginaw’s exuberant Ivan Prosvetov, while also managing to keep pucks out of their own net – no playoff-bound team allowed more goals than the Sting. Meeting only twice in the regular season, there is little rivalry built up between these two squads, but that is sure to change after a few high stakes playoff contests. The Greyhounds are led by the dynamic duo of Morgan Frost, a Philadelphia Flyers prospect who finished fourth in league scoring with 109 points, as well as Barrett Hayton of the Arizona Coyotes. Injuries and a stint with Team Canada limited Hayton to just 39 appearances on the season, though he made the most of them as he put up 66 points, and a 1.69 points-per-game rate of production that ranked third league-wide. Sault Ste. 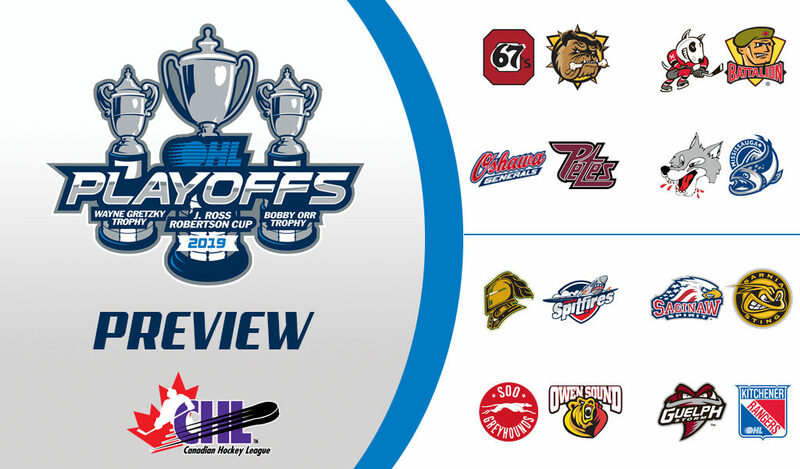 Marie will be out to avenge last year’s playoff disappointment, but will first need to take care of an Owen Sound squad that owns one of the league’s best home records. Deadline departures of Kevin Hancock, who was shipped to London, and Nick Suzuki, sent to Guelph, opened up new ice time for other Owen Sound skaters, including leading scorer Aidan Dudas, a 2018 draft pick by the Los Angeles Kings, as well as veteran forward Maksim Sushko and 19-year-old defenceman Brady Lyle. 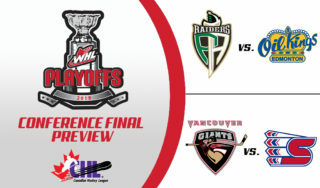 In what could be the most evenly matched series of the opening round, the two Highway 7 rivals virtually split their season series, and could be raring for a quarter-final matchup set to go the distance. The Storm will need to be on their best behaviour against the Rangers, who own a league-best powerplay that is finding the back of the net in nearly one-third of its opportunities. That group is headlined by right-wing Jonathan Yantsis, who has scored a league-leading 24 power-play goals. The Rangers take chances on the man advantage, which has also seen the team give up plenty of short-handed goals too. In Guelph, a breakthrough season for Arizona Coyotes prospect Nate Schnarr has seen the budding forward emerge as the Storm’s top scorer, as his 102 points ranked among the OHL’s top 10 scorers. Meanwhile, the team also brought in offensive reinforcements at the deadline, including Montreal Canadiens prospect Nick Suzuki, who was added from the Owen Sound Attack. Suzuki hasn’t missed a beat since arriving in Guelph, and in fact upped his production as he recorded 12 goals and 37 assists in 29 outings.